Historic Cottage With Amazing Valley & Mountain Views! Welcome to Writers’ Retreat! This one of a kind cottage sits perched on a hillside offering sweeping vistas. 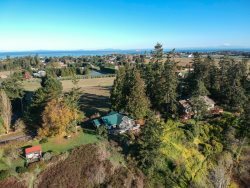 The view over Sequim Valley, historic Lotzgesell Farm and the Olympic Mountain range make it unforgettable. This property and home will give you the ultimate ‘Sequim’ experience! Built in the 1920s, the cottage offers a wonderful country charm you just don't find in newer homes. Local novelist Rachel Bard purchased this house in the 1950s, lived and wrote here, producing several novels. The current owners made a few of these books available for your reading pleasure. Although it has since undergone extensive remodeling, the owners maintained the integrity of the home and the era when it was built. South facing windows make this very cozy home bright and welcoming. Details in the craftsmanship will take you back in time: warm rustic wood paneling throughout, charming tiled floors in the baths and turn of the century doors and knobs are some of the finishing touches that make this home special. The cottage has a queen master suite with attached bath. A queen room and bunk room with two twins share a nearby guest bath. This home sleeps four comfortably. The living room's large bookcase offers a variety of novels and games for you to enjoy, plus a TV and WI-FI for movie night. You will be drawn to the cozy window seat near the propane stove where you can catch up on your favorite novel or take pleasure in viewing the beautiful farmlands below. A charming country kitchen with breakfast bar overlooks the valley and mountains. Additional entertaining space on the large back deck is peaceful and secluded, just perfect for your summer barbeque. Outside you will find some unique landscaping including a beautiful towering madrona tree on the southwest corner of the house. Be prepared to hear wild animal sounds from the nearby Olympic Game Farm, open for daily driving tours. The cottage is centrally located for easy access to local parks and beaches, plus it is about 10 minutes to downtown Sequim. A very popular area for bird watching, cycling, kayaking, and more.